Each nomination must be in written form (e-mail is acceptable) and submitted to an ISPRS Council member. The following is a brief summary of all awards and honors granted by ISPRS. The terms of reference for most awards are also provided in the brochure above. Note that self-nomination is only possible for the von Gruber Award, the Schwidefsky Medal, the Karl Kraus Medal, the Prize for Best Papers by Young Authors, the CATCON Prize and the Doležal Award. The Brock Gold Medal Award is presented for an outstanding landmark in evolution of the photogrammetry, remote sensing and spatial information sciences. The award consists of a gold medallion. Ordinary Members of ISPRS are encouraged to nominate candidates for the Award. Nominations must be signed by two individuals of different nationalities and also a different nationality from that of the candidate. The Otto von Gruber Award is presented to a young (less than 40 years) sole or 1st author of a paper of outstanding merit in the photogrammetry, remote sensing and spatial information sciences written in the four year period preceding the Congress. The Samuel Gamble Award is presented to up to three individuals who have contributed significantly to the development, organization or professional activities of the photogrammetry, remote sensing and spatial information sciences, at national or international level. The Willem Schermerhorn Award is granted to a person who has most significantly contributed to the activities of a Working Group of the ISPRS during the four year Congress period. The Schwidefsky Medal is presented to persons who have made significant contributions to photogrammetry, remote sensing and spatial information sciences, either through the medium of publication as author or editor, or in another form. The President's Honorary Citation (1988) is a certificate of recognition presented by the President of ISPRS to a chairperson, co-chairperson or member of a Working Group of each ISPRS Technical Commissions. The citation is to recognize special, personal and meritorious contributions to the operation of the relevant Technical Commission's activities and advancement of its interests, during the quadrennial term of the Society. The ISPRS Prizes for Best Papers by Young Authors is granted to authors who are less than 35 years old and are the 1st author of a high quality paper presented to the Congress. Each of the eight ISPRS Commissions observes the poster presentations and selects the two best Poster Papers from the Commission. At the Congress, the CATCON Prizes, a Software Computer Assisted Teaching Contest, will be organized by ISPRS Technical Commission VI and funded by The ISPRS Foundation. The main objective of the contest is to promote the development and dissemination of good, user-friendly software packages. The Eduard Doležal Award is a grant for limited travel and expenses of at least one individual, from developing or reform countries, to participate in the ISPRS Congress. Candidates are those who have permanently implemented a practical application of photogrammetry, remote sensing or GIS in an efficient manner or which documents their outstanding success in support of these fields. The U.V. Helava Award is presented to the author(s) of the most outstanding paper published exclusively in the ISPRS International Journal of Photogrammetry and Remote Sensing during the four years preceding the Congress. The Wang Zhizhuo Award will be granted to a person who has made significant achievement or innovation in the spatial information sciences. The Karl Kraus Medal is awarded to authors of excellent textbooks in the fields of photogrammetry, remote sensing, and spatial information sciences, written in one of the official languages of the ISPRS, and published no more than eight years prior to the commencement of the quadrennial ISPRS Congress at which the medal is to be presented. The Frederick J. Doyle Award will be awarded to an individual who has made significant accomplishments in advancing the photogrammetry, remote sensing and spatial information sciences and technologies. A recipient of the award should typically be less than 50 years of age and have outstanding stature within the ISPRS community. The Giuseppe Inghilleri Award is presented to a person who has significantly enhanced the applications of photogrammetry, remote sensing or spatial information sciences in the four years preceding the Congress. With the increased availability of very high-resolution satellite imagery, terrain based imaging and participatory sensing, inexpensive platforms, and advanced information and communication technologies, the application of imagery is now ubiquitous, playing an important role in many aspects of life and work today. Questions that are frequently asked by academia, industry, users, and young students include: What are the major scientific and technical challenges we are facing? What are the state-of-the art in our disciplines? What are the key issues to be addressed in the future? In an attempt to address such questions, ISPRS has prepared a collective scientific vision and research agenda for the Society in the run-up to the 2016 Prague Congress. It has recently been published on-line in the International Journal of Photogrammetry and Remote Sensing as an original article with the title ‘Information from imagery: ISPRS scientific vision and research agenda’ . The paper examines the significant challenges currently facing ISPRS and its communities, such as providing high-quality information, enabling advanced geospatial computing, and supporting collaborative problem solving. The state-of-the-art in ISPRS related research and development is reviewed and the trends and topics for future work are identified. By providing an overarching scientific vision and research agenda, we hope to call on and mobilize all ISPRS scientists, practitioners and other stakeholders to continue improving our understanding and capacity on information from imagery and to deliver advanced geospatial knowledge that enables humankind to better deal with the challenges ahead, posed for example by global change, ubiquitous sensing, and a demand for real-time information generation. The paper will form part of a Special Issue entitled “State-of-the-art in photogrammetry, remote sensing and spatial information sciences” in the International Journal of Photogrammetry and Remote Sensing, which is scheduled for publication in 2016 to coincide with the XXIII ISPRS Congress in Prague, but is accessible now as a free-to-access, in-press article at: http://dx.doi.org/10.1016/j.isprsjprs.2015.09.008. You are invited to read it and provide feedback. Chen, J., Dowman, I., Li, Z., Li, S., Madden, M., Mills, J., Paparoditis, N., Rottensteiner, F., Sester, M., Toth, C., Trinder, J., Heipke, C., In press. Information from Imagery: ISPRS Scientific Vision and Research Agenda. 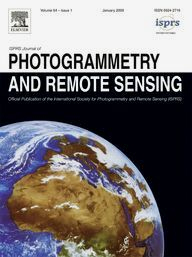 ISPRS Journal of Photogrammetry and Remote Sensing. As the 2016 ISPRS Congress approaches, some Ordinary Members have already started to think beyond. As a first sign, Council recently received a letter of intent from Dubai Municipality on behalf of the United Arab Emirates University, Ordinary Member of UAE, to bid for the organisation of the XXIV ISPRS Congress in Dubai in 2020. In the same year Dubai will host the World Expo. The NMCA Forum will be co-organised by UN-GGIM, the United Nations initiative on Global Geospatial Information Management, while co-host of the Space Agency Forum is IAA - the International Academy of Astronautics. Both fora will be held on July 14 and 15, i.e. during the first week of the Congress and will also feature common sessions. Read more about the fora at http://www.isprs2016-prague.com/program/forums. As announced in the last eBulletin here is the report of the Geospatial Week 2015, a collection of 11 workshops and scientific events held in Montpellier, France, organised under the leadership of Nicolas Paparoditis in late September/early October this year. The ISPRS Archives and Annals have recently been submitted for indexing at the Engineering Compendex, also called Engineering Index or EI. EI ( http://www.engineeringvillage.com/) is a major index and leading engineering information discovery platform and an index of major importance for many scientific authors. ISPRS hopes to be successful and have their proceedings publications included in the EI as soon as possible. Typically, the evaluation of the submission takes several months. ICSU, along with the United Nations Educational, Scientific and Cultural Organization (UNESCO) and the Hungarian Academy of Sciences, was a co-organizer of the 7th World Science Forum held from 4th to 7th November 2015 in Budapest. At the conclusion of the conference, a six-point declaration was adopted. The declaration affirmed strong support for the newly-adopted Sustainable Development Goals, calling for action towards the goals as an underlying approach to all policies. “We are committed to take and promote urgent and transformative steps to enable a shift for a new development path towards sustainable, equitable and more resilient societies and economies,” it said. The declaration endorsed statements published recently by major scientific organisations including IPCC, ICSU, UNESCO, EASAC, and the outcome statement of the international science conference “Our Common Future under Climate Change” co-organized by UNESCO, ICSU, Future Earth and major research institutions in France in July 2015. It reiterated a call contained in the Sendai Framework for Disaster Risk Reduction 2015-2030 to “enhance the scientific and technical work on disaster risk reduction,” and affirmed the importance of sound, independent scientific advice for policy-making. Finally, it called for international collaboration on capacity building and mobilization in the developing world, and an equitable participation of women, young scientists, and minority groups in the practice and application of science, also through capacity-building programmes addressed to young scientists. The full declaration is available here. A declaration aimed to highlight the importance of Earth and space science education in future scientific progress and to reinforce the link between the scientific community, national governments and the public to contribute to sustainable development of society through scientific awareness and actions related to challenging problems of society was adopted on 6th December, 2015. Rising sea levels, growing deserts and variations in the atmosphere: Earth observations and measurement are crucial tools for understanding climate change. In the upcoming Massive Open Online Courses (MOOC) "Sensing Planet Earth" from Chalmers University in Sweden which will start in early spring 2016 one can learn about the tools and methods for measuring the world we live in. Read more on the ideas behind these courses, the target groups and the requirements…..
On 18th May, 2011, a team of Nepalese civil servants successfully climbed to the summit of Mt. Everest. 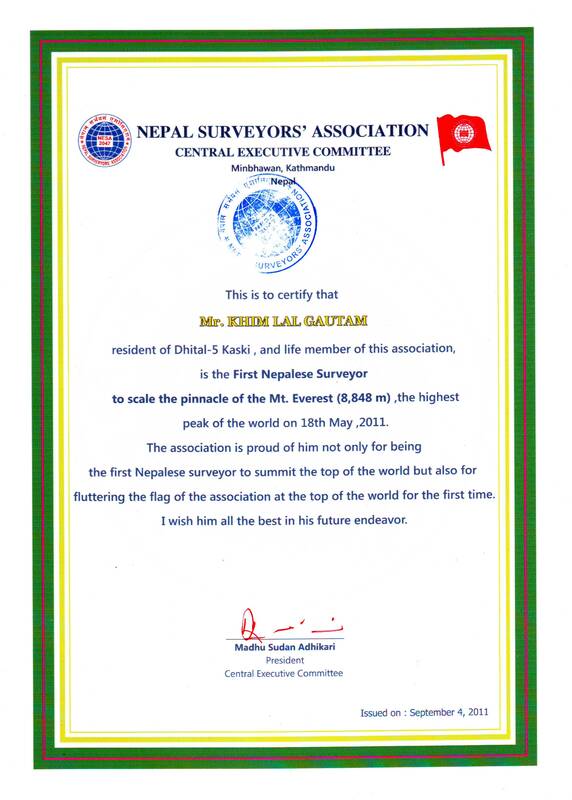 According to the records kept by the Ministry of Tourism and Civil Aviation, Mr. Khim Lal Gautam, a member of the team and a surveyor of the Nepalese Surveying Association, became the first surveying professional ever to reach the peak of the world. ISPRS congratulates Khim Lal Gautam on this outstanding achievement. The SkyTech 2016 UAS conference & exhibition has announced its speaker line-up for January’s event. International experts will consider key developments from across the unmanned aviation industry, alongside discussion of UAS applications for a range of business markets. Perhaps the most exciting branch of commercial UAV technology is its ability to water our creative soil. Cinematography and professional video services are, quite frankly, the sexiest of the UAV industry line-up, and using drones for these purposes has levelled the playing field for directors seeking that perfect panorama without spending thousands on a single helicopter shot. Four major international science organisations are calling for global endorsement of an accord to help assure open access to volumes of "big data" that increasingly are the basis of research and policymaking. 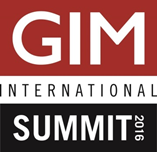 The first edition of the GIM International Summit is drawing closer. The conference committee has been working hard to ensure a varied programme for professional development, networking opportunities and a thorough update of the status of the geomatics sector. The Summit is set to be a dynamic and highly interactive combination of conference and workshops during which delegates will be expected to make a meaningful contribution by sharing their constructive thoughts and ideas. The International Council for Science (ICSU) is seeking an Operations Director to manage the day-to-day operations of the Paris Secretariat, in close conjunction with the Executive Director. The closing date for applications is 3 January 2016. Chang-Martínez, Laura Alfonsina, Mas, Jean-François, Valle, Nuria Torrescano, Torres, Pedro Sergio Urquijo, Folan, William J.
Salas, Eric Ariel L., Valdez, Raul, Boykin, Kenneth G.
Stein, Manuel, Häußler, Johannes, Jäckle, Dominik, Janetzko, Halldór, Schreck, Tobias, Keim, Daniel A.
Johnson, Brian A., Bragais, Milben, Endo, Isao, Magcale-Macandog, Damasa B., Macandog, Paula Beatrice M.
Kaloop, Mosbeh R., Hu, Jong Wan, Sayed, Mohamed A.
Zuidgeest, Mark H.P., Brussel, Mark J.G., van Maarseveen, Martin F.A.M. Lu, Yifeng, Cao, Yinghong, McDaniel, J. Gregory, Wang, Ming L.
BG4.9 "Mapping, Monitoring & Modelling of Vegetation Characteristics using Earth Observation"